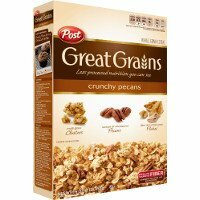 Great Grains Crunchy Pecans cereal contains several heart-healthy ingredients, making it a good choice for breakfast each morning. When needing a light snack, the Great Grains cereal is also a smart, filling choice. The crunchy pecans add protein for a balanced diet while the multi-grain flakes are a good source of fiber in your diet.